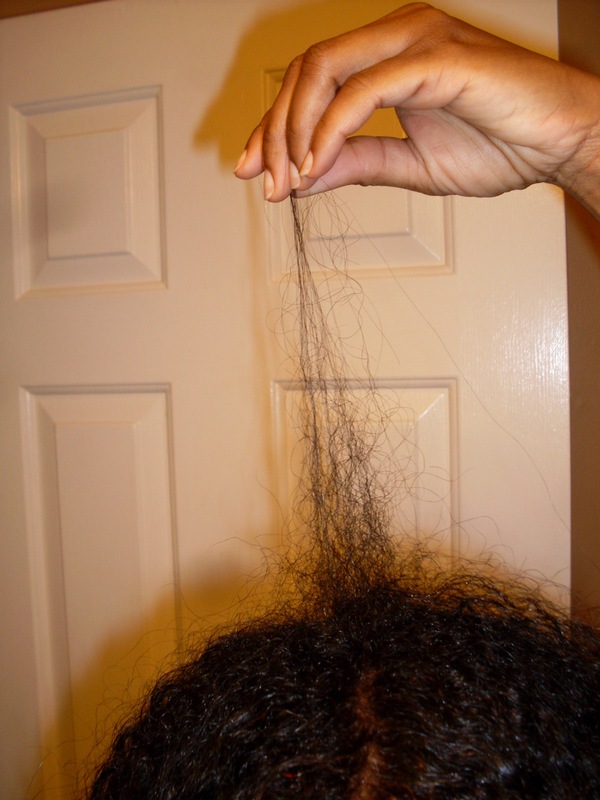 While surfing the GOC blogs, I would often find naturals who were concerned that they were experiencing breakage because they were finding short hairs. Their posts were filled with consternation because they were practicing healthy hair habits and couldn’t understand why they were experiencing breakage. So, this made me want to write a post for those who suspect breakage when they are doing everything “right.” Guess what? Those short hairs may be new growth!! Q: How can I tell if the short hair I see is new growing hair or broken hair? A: This can often be very difficult to determine, especially if the “short hairs” are in areas where breakage can occur (around the hairline, etc.). Your first task would be to examine the hair closely and look for signs of stress on the hairs – such as split ends, stretching, etc. If there are signs of stress or damage, then breakage is the likely cause. This can be doubly certain in cases where breakage would be expected. For example: an individual wears his/her hair in, say, a tight ponytail and begins to notice short hairs at the forehead and temples. Breakage becomes less likely when the short hairs are found in places on the scalp that aren’t exposed to significant stress from the styles worn. For example if you generally wear your hair loose and parted in the middle, but notice hairs that “poke up” between the other hairs on the scalp that are NOT along the parting, there is a reasonable chance that the hair is simply “new growth” in follicles that have recently shed their hairs. Do you hear *snap, crackle, pop* when combing or manipulating your hair? If you do, it’s probably breakage and the best thing to do is handle your hair more gently and ensure that it is well lubricated/saturated (with a pre-poo or conditioner – some prefer wet hair and others on dry) before attempting to detangle slowly from ends to roots. I prefer to finger detangle first as I’m able to feel the bad knots and tangles in order to gently ease them out, rather than ripping through them with a comb/brush. That being said, in 2010 I experienced two things. One, I had breakage along my center part in the Winter of 2010, which I suspect was caused by using a protein-based gel (my hair and protein don’t get along well). In addition, my hair began shedding like crazy and I think that was caused by using amla in my henna, which my scalp did not like. I stopped using that protein gel last Spring and it appears that I have finally resolved my excessive shedding problem by discontinuing use of amla and avoiding getting conditioner on my scalp. As I don’t see a lot of breakage, rarely hear a *snap, crackle and/or pop* and it appears that the end of my short hairs are tapered, I believe my hair is in the recovery phase where the hairs that broke and shed are regrowing. Although I’m certain the short hairs represent more than 10% of my hair, knowing that I’m taking care of my hair as well as I can and am employing a well-founded regimen and techniques, I don’t worry about it. If you think that you are experiencing mechanical damage, then take a closer look at your regimen and/or techniques. However, if your regimen and techniques are on point, breathe a sigh of relief because those shorts hairs are most likely new growth and the result of your healthy hair efforts!! Hummmmm… I thought tapered ends would signify hair that broke off similar to how split ends look. I’d be glad if my assumption was false. That would mean I have tons of new strands. The info I found indicated that the new hairs are tapered. However, I think you can have breakage with tapered ends, especially if the hair is splitting along the shaft. The key is to look at all of these things in conjunction with each other, in my opinion. If you are not seeing breakage on your comb/brush/sink and you are not putting under strain on your strands, then I think there is a good chance that the hair is new growth. I’m glad you wrote this post because I have lots of fuzzies and I don’t think they are broken hairs. They do represent more than 10% but i’ve been very careful with my hair and am always looking for hair in the comb, on the sink and on my clothes. I experience very little breakage and very little shedding. The last time I noticed breaking was when I shared how my hair was snapping when I combed it dry. Well, that was the last time I did that! By the way, I tried the hairstyle that you and Rece did with the bun. I posted a pic in my fotki. I’m going to post on the GOC blog too. 1) Hair did not dry at all! I can’t understand how my hair just takes forever to dry. It’s not even long all over. Yeah, the combing dry is a deadly duo!! Glad you stopped that! LOL! I’ll check out the pics of your updo. As to the bun with the Goody Spin Pins, I’ll try to film that again before the week is over. However, you can’t release the twist at the root. You have to hold that tight with one hand and then loosely wrap/graso the other hair with the ends kind of tucked under to insert the spin pins. And, yes, I agree about the Goody ouchless elastics! That’s why I was so happy to find the spin pins and banana clip. I always have hair wrapped around and ripped out by the elastics. I have minimal to no hair pulled out with the pins and the banana clip. Love ’em!! I sort of rewatched your video again and think my technique is off. I don’t want to cause you any more “work” so let me watch it again while I’m actually doing it lol. unless somebody else wants a re-record? i love the banana clip too. I’ve perfected that technique. As for the elastics, i’m REAL careful but every now and then I have at least 1 hair on it. The first time I did it, I had a little ball that my husband had to untangle! He did a good job but I still lost a little piece. Spin pins made my bun look microscopic too… and if the bun was a good size, it was too loose at the top. LOL. You’ll be cutting off those last strands of relaxed ends soon anyway;-). That explains the curly that have suddenly started growing in the front of my hair. I suspected they might have been the baby hairs that suddenly decided they wanted to be adult hairs. This post describes my hair perfectly. However, my hair is just not cooperating at all and seems to be getting worse as I try. My main focus is to get rid of the short hairs in the front! Also, I have hairs both long and short that are curly at the root and then become straight as it comes down which looks horrible. Please help! I’m going through the same problem.. I just have one question.. What do you mean when you said “white ends” indicates breakage? Hi! I meant that the hair has thinned or split to the point that the ends appear lighter than your hair color.